Mechanicsburg – Boasting a total of 33 race dates for the Lawrence Chevrolet 410 sprint cars, Williams Grove Speedway has released its 2017 schedule of events that offers a great mix of auto racing action. The season gets underway with a Sunday afternoon opener of super sprints race followed by super late models practice on March 12 at 2 pm. Once a staple on the early season schedule, the slated Sunday opener will be the first attempted in several seasons at the track. The super late models will return to the oval on four more occasions during the season including for the return of Appalachian Mountain Dirt Late Model Speedweek to the Cumberland County oval for the first time in six years. The late model speedweek show is slated for June 9 along with the 410 sprints. After a triumphant return to the track in 2016 for the revived Ted Horn/Bill Schindler Memorial, USAC will again return to the track, in an even bigger way in 2017. The USAC Triple Crown Showdown featuring all three USAC touring divisions, the Silver Crowns, Sprint Cars and Eastern Midgets, will take place at Williams Grove on Thursday and Friday, June 15 and 16. The Triple Crown Showdown will showcase the USAC Sprints Cars and the USAC Eastern Midgets on Thursday, June 15 followed by the USAC Silver Crown Horn/Schindler Memorial 100-lap event on Friday night, also featuring the USAC Eastern Midgets. The June 15 appearance by the regular USAC Sprints will be the first at the track since Billy Pauch beat the band at the track in 1996. The World of Outlaws sprint cars again return to the track next season for a total of seven events including the series customary two-day May and July stands along with the three-day, 55th annual National Open on September 28, 29 and 30. Champion Racing Oil returns to sponsor the National Open in 2017 as well as the Summer Nationals on July 21 and 22. The Arctic Cat All Star Circuit of Champions sprints will make two appearances at the track in 2017, an increase over the 2016 season that saw only one program booked. All Stars action is slated for the Tommy Hinnershitz Memorial on April 28 and the Jack Gunn Memorial on August 18. The United Racing Club 360 c.i. sprints have three dates inked on the 2017 schedule while the regular Williams Grove HJ Towing & Recovery 358 sprints enjoy a 13 show schedule. The HJ Towing & Recovery 358 sprints will compete in their marquee season event paying $2,500 to win and $250 to start on September 15. Other divisions appearing on the 2017 schedule include the PASS IMCA 305 sprints and the super sportsman along with racing of a two-wheel variety as well when the AMA Pro Flat Track Motorcycle Series stages an event at Williams Grove Speedway. 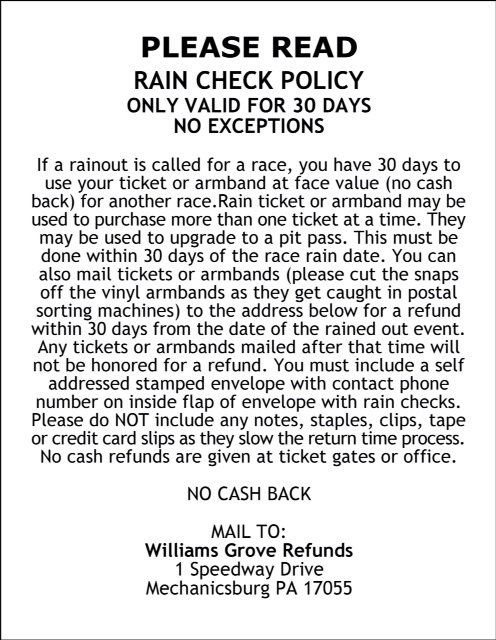 The September 9 AMA Motorcyle racing program will be an independently operated racing event at Williams Grove and as such, Williams Grove season seats, season admission passes, gift certificates, parking passes, etc., will not be honored. The regular Lawrence Chevrolet Williams Grove 410 sprints cars, aside from competing in the season-long point title chase, will also be taking part in two other series of races within the overall title chase. The Hoosier Diamond Series will again be staged with a champion declared based on performances in select increased purse races during the year while the Yellow Breeches 500 races take place as well, dotting the schedule during the season from March through August. The Yellow Breeches 500 races will be handicapped races paying a healthy increase of $500 to start each feature. The Diamond Series will be highlighted by the September 1 Van May/Kramer Williamson Tribute Race for the 410 sprints and URC Sprints. 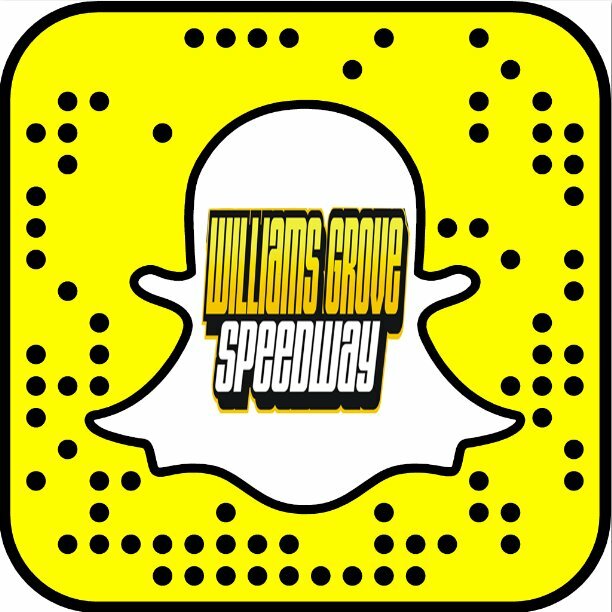 To see the full 2017 Williams Grove Speedway schedule of events, visit the oval’s official website, www.williamsgrove.com.